Unfortunately, the magazine is currently on publishing hiatus as we look at the business model to see if it could be made to work. 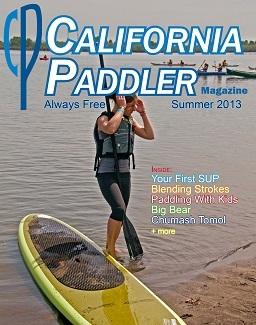 California Paddler Magazine (formerly California Kayaker Magazine) is a print and online magazine focusing on being the source for paddlesports information for the Southwest (CA, OR, AZ, NZ, and beyond). We are dedicated to promoting fun and responsible paddling, and advocating for increased paddling opportunities in this region. The stories in California Paddler Magazine are written by local experts and include articles on places to paddle, tips on how to improve your paddling experience, and information of concern to paddlers and the local paddling environment. Covers all types of paddlesports (sea kayaking/touring, white water, surfing, fishing, stand up paddling, canoeing, etc.) and for paddlers of all levels (those entering the sport to pros). Readers can pick up a free copy at local kayak, SUP, and sports shops, or get the free electronic version.